Always good fodder for a slow news day, and when The Prankster needs to concentrate more on festive jollifications than blogging. Yet again, Civil Enforcement Limited fail to run up in court. Yet again it seems an attempt may have been made to trick the defendant into not turning up as well, with an email from 'Sharon' asking the defendant to urgently get in touch.. It is not known whether the defendant was awarded costs. With reference to the Judicial Review that the above firm will be applying for I thought that you may find the following witness statement of assistance. It reveals the extent to which the Proserve enforcement model appears to fail to meet the DVLA's/Government's requirements on so many levels. 3. I have read the letter dated the 4th June 2014 from the DVLA to Mr Duff of Proserve Enforcement Solutions and noted that it comments that “Although you have made the point that your primary purpose is to take action to ensure that your clients are protected against unlawful interference with their land, the nature of this interference is parking-related trespass, which is regarded as a relevant obligation in Schedule 4 of the Protection of Freedoms Act. The measure adopted by ProServe to enforce this where the use of DVLA data is involved is the same as those of traditional parking operators, i.e. the imposition and pursuit of charges.The introduction of the ATA model and its subsequent extension to all parking companies came about in order to put in place parameters for operators without formal regulation or governance. You have set out your position with regard to matters such as signage, ticketing, charge levels and appeals, but these are matters which successive ministers have regarded as being for an ATA to monitor and ensure compliance with, so as to provide the necessary assurances to DVLA that our data is being used appropriately. I should also point out that the minister's requirement is that motorists are offered an independent appeals service if the appeal is rejected by the company that issued the charge”. 4. On the date I received a Charge Notice from Proserve Enforcement Solutions demanding from me damages for an alleged trespass or breach of contract for a vehicle allegedly parking at name of site. Added to the claim was a sum allegedly for VAT although VAT could not lawfully be added to any claim for damages. I regarded this as a false representation. 6. On the date I received from the County Court a claim form claiming damages for a breach of contract or a trespass and which appeared to have been issued by Mr Duff. Mr Duff had signed the statement of truth on that claim form although, I understand, he is not a Solicitor or otherwise authorised to sign such a statement of truth. It is my understanding that Mr Duff is not authorised by an appropriate regulatory body to conduct litigation under the terms of the Legal Services Act 2007 nor to act as a Solicitor under the Solicitors Act 1974. 7. I understand that Mr Duff/Proserve Enforcement Solutions is contracted to undertake enforcement action against any party allegedly parking in contravention of a land owners requirements at the site and has caused to be erected at site notices setting out the land owner’s requirements. I understand that in the case of Ransomes Park Limited v Nicolas Anderson the Judge, on appeal, concluded that the signage used by Mr Duff was unclear and ambiguous and could not be relied upon. Mr Duff has not amended his signage at site since that decision. 8. Mr Duff did not permit me to have any access to any independent appeal service. The Prankster advises potential customers of parking companies to check up on their previous customers before committing themselves. Some parking companies have cordial relationships with their customers...and some do not. Take Civil Enforcement Limited, for example. The Co-op engaged them to manage their car parks some time ago but seem to have lost total control. Even when the Co-op want CEL to cancel parking tickets, they are ignored. Thank you for your email and your comments are noted. As advised in my earlier response, it is simply a statement of fact that CEL and DEAL will not respond to requests from Co-op to discontinue Court actions, regardless of the reasons for such requests. Accordingly, it is not a question of this issue being escalating to another level of authority within Co-op, but that CEL/DEAL will not accede to such requests, regardless of who they emanate from within Co-op. Where Co-op is able to comment further, I have endorsed responses below. I trust this clarifies the position, as I do not think that Co-op is able to assist further in this matter. The Prankster understands that CEL are no longer used by the Co-op, which is not surprising. Civil Enforcement Limited destroy Co-op's customer base by pursuing Co-op customers to court for minor parking transgressions. A customer overstaying for a few minutes by shopping is not expecting to have to fork out several hundred pounds for the privilege - CEL increase the amount claimed to around £500. This no doubt ensures the customer will never return to the Co-op. The Prankster suggests landowners who want their car park managed find a parking company who will work with them to maintain and improve their customer base rather than destroy it. A1JD0339 ParkingEye v Mr M. Chippenham Court, 16/12/2014 in front of DJ Asplin. Not being the driver is no defence. £100 awarded for claimant, plus £90 costs. The Prankster rocked up in Chippenham Court to observe a ParkingEye case. He was primarily there to see if ParkingEye informed the judge that the case law they most rely on, ParkingEye v Beavis case was being appealed. As it turned out, that was not relevant to the case in hand. ParkingEye were represented by Stacy Payne from LPC Law while the defendant represented himself. DJ Asplin conducted the hearing, and began by apologising for the formal setting. He explained he would summarise the case. The case concerned a Holiday Inn car park in Bath. The defendant's vehicle was parked there for 3 hours without being a guest of the hotel. The published charge for parking there for that length of time was £100. There are other charges for parking if you are a guest. Prankster note. Without seeing the signage, The Prankster assumes the learned judge was wrong on this point. In all other ParkingEye car parks The Prankster has seen, the charge is for breach of contract; not a contractual charge as the judge described. The judge made a wry comment as to the size of ParkingEye's bundle he had been forced to wade through beforehand, but commented that it contained authority from the hotel for ParkingEye to act, photographs of the number plate and signage, and that it went on at considerable length regarding the legalities of the case. The defendant's case, on the other hand, consisted of the single point he was not the driver. The car was owned by his company and was a pool car which could have been driven by any of 5 other people, none of whom had admitted to being the driver. The judge explained kindly that although the defendant might think that a clever defence, parliament had fixed that loophole 2 years ago, and that was no longer a valid defence. He explained ParkingEye had a right to levy charges, that the driver was not staying in the hotel, and that the driver was responsible for the charge. As no-one had come forward admitting to be the driver, the responsibility therefore fell on the keeper of the vehicle. The case was over in 5 minutes without the claimant needing to speak, and with only a few sentences from the defendant. DJ Asplin awarded the parking charge of £100, £15 court filing fee and £25 hearing fee. He explained he was not convinced about the solicitor filing fee of £50 but after some debate between himself and Ms Payne, in which the motorist did not join in, decided to award it. Prankster note. There are several reasons why this fee of £50 is not valid. HHJ Moloney in ParkingEye v Beavis did not award this fee. Ms Payne, looking somewhat embarrassed, explained she had also been requested by ParkingEye to ask for her costs. The judge asked where she came from, which turned out to be Great Malvern. The judge queried that although Chippenham's solicitors were in decline, surely ParkingEye could have found someone local. Ms Payne explained she was not asking for travel costs but her fee of £175 plus VAT. The judge ruled these were not allowable costs in a small claims court unless the defendant had behaved unreasonably, which he had not. The final total came to £190 which the defendant paid immediately. Prankster note. The defendant was lucky. Not being the driver has no hope of being a valid defence. Other judges may have ruled he behaved unreasonably in defending the claim, and so awarded higher costs. So as it turned out, Beavis was not mentioned at all, and all Ms Payne had to do was quibble about costs. The Prankster recommends that motorists research the legal aspects of the case more fully before preparing a defence, and that if they don't want to do this, the safest option might be to pay up rather than risk an extra £200-£300 of costs. Of course, the best option is to fully engage with the appeals process and get the charge cancelled at POPLA. So far, all ParkingEye's charges have been found to be penalties (and therefore invalid) by POPLA. The transcript of the appeal judgment in Ransomes Park Limited v Anderson is now available on The Prankster website, and will make useful reading for anyone who is being sued by Proserve Ransomes or any other site which uses Proserve. 1) The signage is gibberish and cannot be used to create a contract. HHJ Moloney concisely deals with this in points 13 to 16. 2) A trespass has occurred and so some damages are payable. HHJ Moloney had no idea what these would be, and to order a re-trial to assess these would be out of proportion to the costs involved. With the consent of both parties, he therefore took the pragmatic view that he would guess at an amount. However, he made it clear that this was a guess and that this would not set a precedent for future cases. He also made it plain that in cases of trespass, it is the actual damages incurred which count. It was laughable that all 18 cases on one invoice were charged at one hour each. 3) In future cases, Ransomes will need to prove it was liable to pay Proserve the amount invoiced. ever liable to pay Proserve, based on the fact that it did not seek or receive any proof from Proserve that the time had been expended. That is not a ground of appeal in this case, but in future cases I consider that as part of proving its loss Ransomes should plead and prove the amount of work that Proserve did, or is likely on the basis of its general business model to have done, in relation to the particular case in question. 4) It is also open to any defendant to prove the work could have been done cheaper. open to the defendant to reduce the amount of his liability by proving that the claimant has failed to mitigate his loss. That is to say, proving that there were reasonable steps open to the claimant to reduce his loss but the claimant unreasonably failed to take those steps and thus, in effect, unnecessarily increased the amount of his own loss. If a defendant can show that, then he need only pay the lesser sum that the claimant ought to have lost and not the greater sum that he in fact lost. At this point, The Prankster would like to introduce the relevant part of the costs document used by Excel Parking in POPLA appeals. As you can see, Excel can do the job of issuing a ticket and getting DVLA data for the sum of £11.21 + £9.67, or a total of £20.88. Numerous other parking companies also have figures that come out around the £20 mark for this kind of activity. The Prankster therefore suggests that any motorist who believes he has trespassed makes an offer of £20.88 to settle. However, it is also worth noting two other points. 1) HHJ Moloney failed to take into account the fact the Proserve were already paid a fixed fee by estate residents to patrol the estate. This should therefore not form part of any costs and an estimated 'patrol' fee can be deducted from the £11.21. 2) If a trespass occurs the trespasser should be given sufficient warning to depart. If you abandon your vehicle, you may therefore be liable, but if a Proserve employee comes up to your vehicle while you are there and photographs it without first asking you to move, you may not be. 3) If you are there, you can also mitigate Proserve's loss by offering to pay up there and then. This will remove the £9.67 costs and most of the £11.21. The Prankster suggests an offer of £5 would be sufficient to cover costs. Make a note of your offer, and if rejected, get the Proserve employee to sign they he has rejected your offer. On a side note, Proserve have been given permission to move forward to a Judicial Review to see whether they need to join an ATA before the DVLA will give them keeper details again. This will take place sometime in 2015. The British Parking Association run an appeals system (POPLA), which although it has its faults, is at least mostly independent, mostly open and in its own way mostly fair to the motorist. The Independent Parking Committee on the other hand run an appeals system (IAS) which is held behind closed doors, can be provably influenced by the IPC and from the results, is biased towards the parking companies. 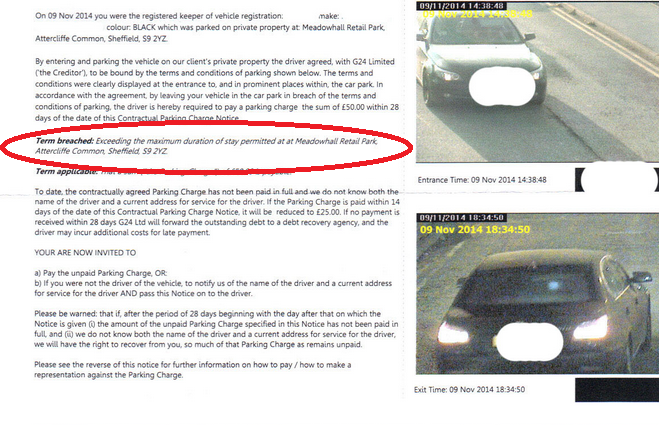 Nothing illustrated this more than two results for G24 Parking who recently left the BPA for the IPC. The Appellant raises several grounds of appeal but it is only necessary for the purposes of this appeal to deal with one. This is the submission that the parking charge does not reflect a genuine pre-estimate of loss. Where such a submission is made, there is a burden on the Operator, and not the driver, to provide a genuine pre-estimate of loss which details how they calculated the parking charge amount. It does not need to be particularly detailed or amount to exactly the charge amount because it is simply an estimate. However, one must be provided. The Operator has not provided any evidence which establishes the charge reflects a genuine pre-estimate of loss. They simply state that their charge amounts to liquidated damages and is in accordance with the recommendations of the BPA. This is not sufficient to discharge their burden and so I cannot find that the charge is justified in this case. Therefore, I find that the charge is unenforceable and the Appellant is not liable to pay it. Accordingly, I allow the appeal. The Appellant raises a number of challenges, which I will respond to in turn. 1a This appeal is not concerned with the failures or otherwise of the internal appeal. The Operator is a member of the IPC. 1b In this appeal the Operator does not have to prove anything, the onus is on the Appellant. A breach of the code of practice does not automatically mean that the charge is invalid. The requirements of the code are best practice. Falling short of best practice does not mean the Appellant had insufficient notice. I can read the content of the sign the Appellant claims is unreadable and the significant terms are no different from the other signs at the site. 2 Genuine pre-estimate of loss. Again it is not for the Operator to prove but for the Appellant. Where the claim is for breach the test to decide whether the charge is valid is to consider whether the charge is proportionate, has a tendency to deter, and is commercially justifiable. The intention was clearly to deter drivers from parking beyond a period of time. When one considers the likely cost of managing checking and enforcing the site, in the absence of any evidence to the contrary I find the charge proportionate, and as the Operator’s only income commercially justifiable. 3 The Appellant has provided no evidence this sign was nearest their car. 4 This is not relevant. The Operator contends they are bringing the charge not for overstaying but on the basis the Appellant was not a customer. This is clearly a term and the other terms on the contractual sign make it clear that by breaching this term the Appellant is liable to pay the charge. 5 This is therefore irrelevant since I consider a contract has been formed. Finally I do not find the contract ambiguous and therefore the doctrine of ‘contra proferentem’ does not apply. In this particular case there are even more worrying elements. The adjudicator dismissed a statement by the keeper as untrue because the keeper had provided no evidence to back this up. This is clearly absurd. The Appellant has provided no evidence this sign was nearest their car. The adjudicator also made up his own 'facts' to suit his arguments. This is clearly not true. The NtK clearly states the charge is for overstaying. Furthermore, the assessor clearly does not understand contract law, and is not therefore fit to be an assessor. I can read the content of the sign the Appellant claims is unreadable and the significant terms are no different from the other signs at the site. The first sign shows the charge is a contractual charge (you can stay longer than 3 hours. The charge is £50). The second shows the charge is for breach of contact (You can only shop here. If you go elsewhere you are in breach of contract) (Prankster note. Staying longer than 3 hours does not appear to be one of the 5 terms and conditions which attract a parking charge). This is fundamental to parking contracts and any assessor who does not understand the difference is not fit to work as an assessor. Furthermore, the assessor is clearly lying when he says 'I can read the content of the sign the Appellant claims is unreadable'. The Prankster defies anyone to read the sign from the photograph above. An assessor who cannot tell the truth has no place in being an assessor. The Prankster considers this is ample proof the IPC appeals system is a kangaroo court and not fit for purpose. How can a parking company which has had its Genuine Pre-Estimate Of Loss calculations consistently ridiculed by POPLA for 2 years suddenly come up with a convincing explanation of its losses to a different appeals system? How can a charge which it is admitted is the 'Operator’s only income' possible equate to a loss if it is used to run a profit making company? The Prankster calls on the DVLA to suspend the ATA status of the IPC until they use a system which runs on the same lines as POPLA, and which is seen to be fairly run. Furthermore, the Prankster calls on the DVLA to require the IPC to name the assessor used for the above case, and to ban them from further assessments. Meanwhile The Prankster notes that should G24 want to proceed to court if the keeper does not pay up, then keeper liability under the Protection of Freedoms Act 2014 does not apply. Under the act, the reason for issuing the charge must be stated. As G24 have confirmed the charge is for not being a customer to the IAS, they cannot change their tune in court. In any case, staying longer than 3 hours is not one of the terms and conditions which attracts a parking charge. The RAME charity bus case was featured on BBC TV and can be seen here: http://www.nmag.co.uk/nmag-tv/. An 84 year old man was pursued by a parking company as the keeper of a vehicle. His details were obtained from the DVLA who had no right to hand them out as the driver had already been identified. During the investigation the parking company lied to the DVLA; the DVLA accepted at face value the parking company account and did not check them, thus compromising the investigation. 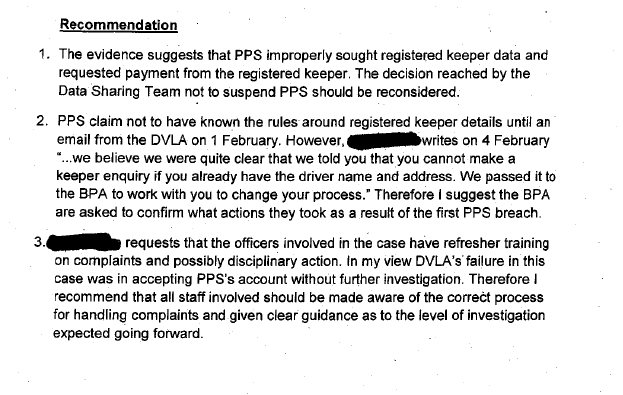 "DVLA officials accepted at face value the account of events provided by Premier Parking Solutions (PPS) and did not check thoroughly enough the information provided. This compromised the investigation and led to the Agency making a decision with only some of the facts"
"I have also asked for work to be undertaken to improve the way in which complaints of this nature are handled. This will ensure that they are processed through the appropriate channels at all stages. I can assure you that the staff concerned recognise the need to ensure that each complaint is investigated properly"
The investigation into the complaint made the following recommendations. Now we are a year on from the parking event, The Prankster asks if any lessons have been learned by the DVLA. What is the nature or the work undertaken to improve the way in which complaints are handled? Many people have contacted The Prankster to say their complaints to the DVLA are being fobbed off. Here is a typical example. Thank you for your email received on 2/12/14. Your email reference number is xxxxxxx. If the DVLA are not regulating the private parking industry, and the British Parking Association are not regulating the private parking industry, just who is? 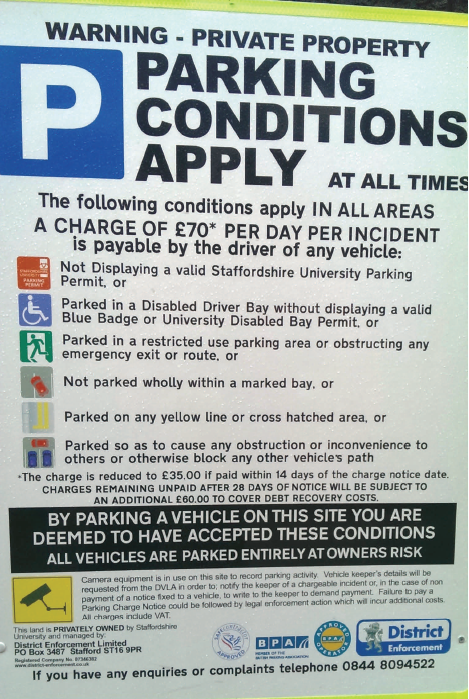 The Prankster previously reported that District Enforcement Ltd had decided not to appeal a case regarding Staffordshire University car park where the judge ruled the signage was ambiguous and the car park markings not obvious. This was incorrect - the court staff were a few days behind, and it has now been discovered the appeal was lodged after all. The Prankster's view remains the same. The Unfair terms in Consumer Contract Regulations 1999 (UTCCR 1999) apply. favourable to the consumer shall prevail but this rule shall not apply in proceedings brought under regulation 12. As a judge has already ruled the contract (signage) is ambiguous, then 7(2) will apply, which means, in The Prankster's opinion, District Enforcement have no hope in enforcing tickets for parking completely outside marked bays. He suggests that rather than chuck money away in legal fees for an appeal, they spend the money to change the wording of the signs, or paint markings such as hatchings, or both. District Enforcement will of course know all about UTCCR 1999 because the company was formed by 3 fast-track law graduates from Staffordshire University. Mystery shrouds their contract with Staffordshire University and why it was apparently awarded without any tendering process. Meanwhile, 2 of the original directors have left, leaving only Danil Kurpil. Graham McKie was the latest director to leave on 27/10/2014, with documentation filed on 3/12/2014. Here is the signage in question. The 6th condition clearly implies you can park outside marked bays as long as no obstruction is caused, and as long as conditions 3 and 5 are not broken. 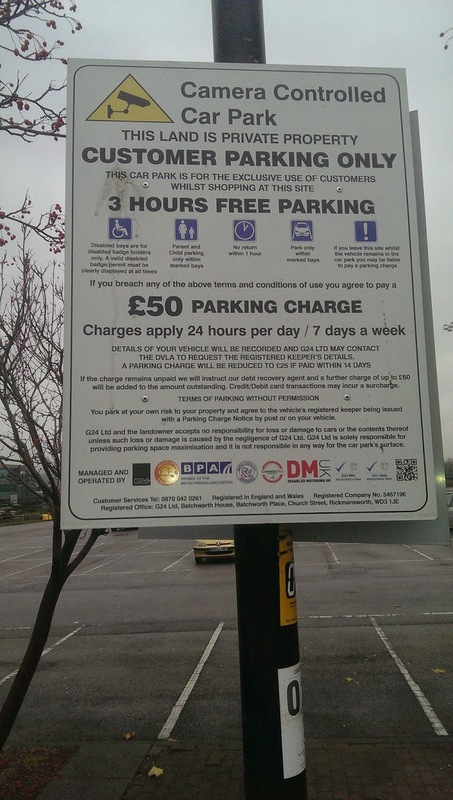 However, it is also apparent from the signage that there is no genuine offer to park and that the charge of £70 is a disguised penalty, and therefore unenforceable. The motorist was awarded around £86 in costs. CEL play a clever numbers game. In the 18 months from 1 October 2012 to 31 March 2014 CEL filed 2094 claims, or 116 a month (FoI 85865 from the MoJ) . Only 55 cases were heard between August and October (inclusive) or 18 a month (MoJ figures). For each hearing they fail to turn up to, it costs £35 filing fee, £25 hearing fee, plus defendant's cost. Not all judges will award costs, while some will regard CEL's behaviour as unreasonable and award more costs than are normally allowed in the small claims court. Let us set an average figure of £100 for costs, which is probably on the high side. This is an exceedingly good profit, using the court system as a form of scary debt collector, but rarely following through to actual hearings. In all reported cases when they do turn up, CEL get soundly spanked at court, because their claims are without basis. Did Oliver Morely deceive Parliament regarding keeper enquiry costs? The House of Commons Transport Committee published on 1 September 2014 a document entitled 'Government motoring agencies - the user perspective'. The document make interesting reading and is available here. Paragraph 43 of this report states as follows. 43. There are widely-held concerns that the DVLA profits from the sale of the data it holds on drivers. The Government’s motoring agencies set their fees at a level that will cover their costs (the VCA is required to make a small operating surplus). The DVLA told us it is currently making a loss from charging for the provision of information to parking companies. It charges £2.50 for each enquiry. It costs the DVLA £2.84 to process each request. The difference between income and cost for this service last year was a shortfall of around £700,000, which represents 0.1% of the DVLA's total costs. The DVLA should not subsidise private parking companies by providing data at a loss, if anything it should err on the side of making a small surplus. As it reviews its fees and income, the DVLA should consider whether efficiencies can be made to reduce the cost of processing these requests. If not, the DVLA should adjust the fee for the provision of personal data to ensure costs are covered. The DVLA should make clear on its website how the costs are calculated. It should also consider whether the enhanced provision of information to drivers, as recommended above, could be financed through the fee. This information is partly sourced from a letter Oliver Morely, the Chief Exectivie of the DVLA, wrote. This letter is available here. Part of this letter runs as follows. Direct costs include staff costs and consumables and IT costs cover system scans that are variable on volume and relate directly to the release of vehicle keeper information. Overhead and development costs include contributions to organisational system developments, the finance and policy support functions as well as human resources and estates etc. The difference between income and cost for this service last year was a shortfall of around £700,000, which represents 0.1% of the DVLA's total costs. The fee level was set some years ago and reflected the position at that time, but costs fluctuate. Typically over time individual DVLA services shift from slight surplus to slight deficit positions, particularly if apportionment rules or fixed cost bases shift. Due to these fluctuations and changes in the way that DVLA costs are apportioned, it is difficult to provide a cost comparison year on year. However, given the small scale of either the under or over recovery of costs on this service, the impact on the organisation has been negligible. The Prankster notes this freedom of information request which states the basis for this unit cost is from the 2013/14 costing model. A. The unit cost of £2.84 was calculated as a result of DVLA’s costing model to cover the 2013-14 financial year. The Prankster also notes this freedom of information request which gives the total income in 2013-14 from data sharing activities as £12.9m, and the total expenditure of £12.2m (giving a profit of 0.7m). The Prankster further notes this DVLA publication, which shows who the data is shared with, and gives number of enquiries and the charge per enquiry. Altogether in 2013-14 there are 9 different types of enquiry, and 27 different classes of organisation (some duplicated) accessing it. The total number of enquiries is 17,998,048. Far from Parking companies being subsidised by the taxpayer, the true situation seems to be the other way round. The average cost per enquiry appears to be 0.67 pence, rather than the £2.84 stated by Oliver Morely. In fact, The Prankster struggles to see where the £2.84 comes from. There were 17,998,048 enquiries of all types. If they cost £2.84 each, this would cost £51.1m, far more than the actual £12.2m stated. There were 13,260,563 Electronic Vehicle Enquiries (the same type as parking companies make). If they cost £2.84 each this would cost £37.7m. The figures therefore do not add up. The Prankster thinks this puts to bed the fiction that parking companies are being subsidised by the taxpayer. In fact, the parking companies are subsidising the taxpayer by £2.50 - 0.67 = £1.83 per enquiry. Moreover, there does not appear to be a shortfall of £700,000. Rather, there appears to be a profit of £700,000 (5%). As the DVLA are not allowed to make a profit, they have renamed the profit to 'a contribution to Agency overhead costs'. While DVLA is permitted to charge a fee for the release of information under the reasonable cause provisions, it is not permitted to profit from it. Although income was higher than costs in 2013-14 the remainder is a contribution to Agency overhead costs. If all this data is correct, The Prankster wonders whether Oliver Morely has been deceiving The House of Commons Transport Committee and if so what should be done about this? There will of course be variations in cost between providing the different types of enquiry (for instance, some are paper based, some fax based, some telephone based and some use direct data links), but this does not seem sufficient to account for the discrepancy - especially as most parking company enquiries use direct data links which would appear on the face of it to be the cheapest solution. The Prankster would also like Mr Morely to explain this sentence 'IT costs cover system scans that are variable on volume' which appears to be meaningless gobbledygook. Notorious self-styled 'ethical' parking company District Enforcement, who have been managing an unpopular and Draconian parking scheme at Staffordshire University, suffered a humiliating defeat in court to a lecturer who has spent more than a year arguing that he did nothing wrong when he parked at work. The verdict at Stoke-on-Trent County Court is an embarrassment to the university who are under fire from staff and trades unions for dealing with the company without a formal tendering process. There are reports of secret behind-the-scenes deals to keep parking cases out of court. The legal advice to District Enforcement after their defeat might have come straight from the Prankster. Despite their director Danylo Kurpil saying 'it's not over yet' as they left court - and insisting they would appeal even as his solicitor Mr Perkins was muttering 'well done' to the successful driver - they have not filed an appeal within the required 21 days. It now looks like they are on the run, if recently-filed documents are anything to go by. A second of the three founders - who are Staffordshire University fast-track law graduates - has quit as a director , and they're changing their registered address from Stafford to Swadlincote - nearer to Kurpil's home. He said he would proceed without the contract. He noted that a POPLA appeal had been rejected and that this carried no weight in the County Court. He addressed instead the question of the signs on the University car parks. These referred to a parking permit system which was not introduced until more than eight months after the parking event, and said a charge was payable (among other things) for anyone who parked not wholly within a marked bay. There is a graphic of a car parked across a white line. Not Parked Wholly Within Bay (sic) was the reason given for issuing a Parking Charge Notice in March last year to Mr Hudson, a senior lecturer at the University in Stoke-on-Trent. As the marked bay argument began to look weaker, District Enforcement's solicitor tried to claim the car was parked in a restricted use area because there was a fire assembly point sign on the building next to the car (even though this bore no relation to the reason given for issuing the ticket). The judge said there was no reason people couldn't assemble next to a parked car and there was nothing in the Highway Code to suggest parking wouldn't be allowed there. The defendant observed that government safety guidance says that fire assembly points should be far enough from buildings to avoid falling debris. Under questioning from Mr Perkins, the defendant said he parked safely where he and others had parked many times before. DDJ Evans was robust in his comments: "The signs are very misleading. It is settled law in relation to private parking that if there is clear and adequate signage a contract is formed. The first condition [displaying a valid permit] wasn’t in place – and wasn’t in place for several months. There are no yellow lines to prevent parking where Mr Hudson’s car was parked. I don’t accept that the sign is clear and I cannot see that Mr Hudson is in breach of these particular parking conditions. I can completely understand that where there are marked bays anyone parking across the lines and taking up two bays would be causing a problem. But for that to apply, there must be a marked bay and all down that area there are no marked bays. There are no double yellow lines or hatched areas to indicate no parking. The claim is dismissed." 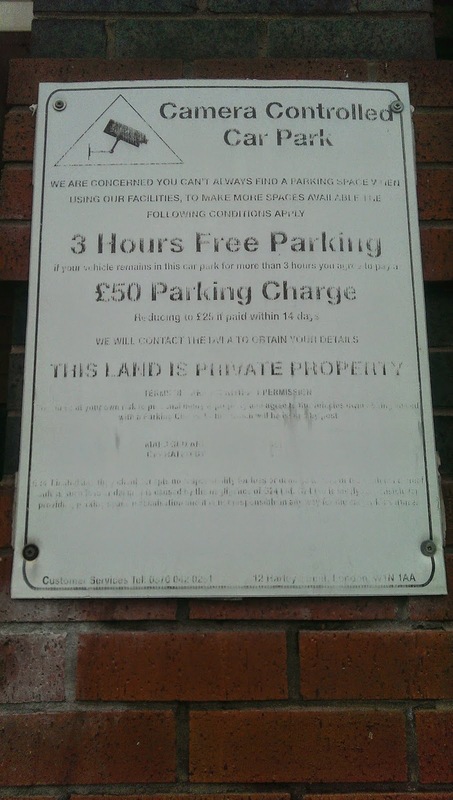 Judgment based upon interpretation of parking charges sign. Conditions say no parking in restricted use area – near fire assembly point alleged. My view no indication that a restricted use area and not an emergency exit. Also “not parked wholly within a marked bay”. My view was to be wholly within a marked bay there must be a bay. None there, so no contravention. These are not findings of fact but findings of interpretation. Since the judgment, the university's staff have continued to place tickets on cars parked other than across the white lines of the marked bays. At least half a dozen legal points which could completely invalidate District Enforcement's charges remain untested in court and so far the case has cost them many hours fruitless preparation, numerous solicitor's letters, a POPLA fee, court costs and the solicitor's court fee. With absolutely no return on this investment of time and money, District Enforcement are beginning to look a little silly. The Unfair terms in Consumer Contract Regulations 1999 apply. .As a judge has already ruled the contract is ambiguous, then 7(2) will apply, which means, in The Prankster's opinion, District Enforcement have no hope in enforcing tickets for parking completely outside marked bays. He suggests they either change the wording of the signs, or put markings such as hatchings, or both. The Prankster's view is that the landowner has the right to enforce parking conditions, but that these should be fair and should not be used as a cash cow. If there are areas in the car park which the landowner wishes to keep clear, then these should be clearly marked as not for use, especially if cars regularly park there. 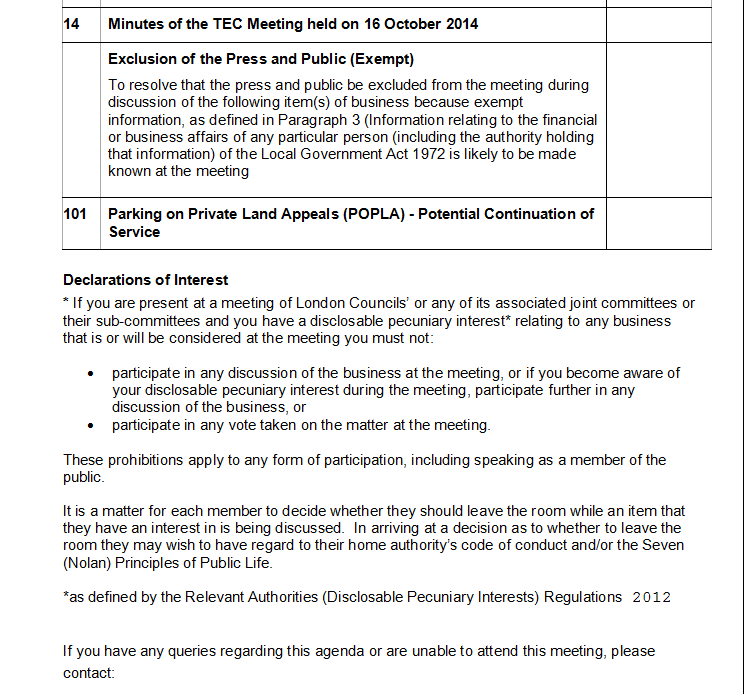 On Thursday London Councils will be meeting to discuss amongst other things the fate of POPLA. Item 101, discussing the continuation of the POPLA service, will be held behind closed doors. No doubt all will become clear once the minutes are available. The Prankster has been in touch with the Royal Mail regarding the continual problems Armtrac Security Services seem to be having with mail delivery. They regard it as implausible, for instance, that a letter posted on 1 November will float around in the system and only be postmarked on 25th November. Normally envelopes are postmarked as close to the point of entry of the Royal Mail as possible. The Royal Mail have therefore asked all affected mail recipients to contact them and send them a copy of the letter, and the envelope it arrived in. You should also say which day the letter arrived. They can then investigate to see where the problem is, if indeed there is one with the Royal Mail. If there is not a problem, The Prankster suggests that the motorist contacts him and also the British Parking Association. If Armtrac have already provided some excuse as to why the mail was late, that should also be copied to the Royal Mail so it can be investigated. I have received a letter from the above company which was delivered late. The letter is dated x; the envelope is postmarked y; it was delivered on z. I enclose copies of the letter and envelope. I have been made aware from other people in the same situation that this is a regular problem with mail from this company. The way parking companes work is that appeals are only allowed for a limited time from the date on the letter. By the time the letter actually arrived this time has expired or almost expired. I am therefore asking you to investigate to determine if there is a genuine problem with the Royal Mail with post delivered from this company, or if the company is using sharp practices to prevent motorists from appealing parking charges. A0JD1405 ParkingEye v Cargius. (25 November 2014, Wrexham County Court). DDJ Mahy dismissed the claim, The charge of £100 far exceeded the cost of the overstay (£2) and subsequent costs. Commercial justification did not apply because the car park generated substantial revenue and therefore it was not necessary to charge large amounts for transgressions to make management commercially viable. Mr Cargius has generously made the full judgment available which can be downloaded from The Prankster website as exhibit CS027 from the case law page. The Prankster recommends that all motorists being charged for overstay in paid car parks reference this case in their defence, and file a copy of the judgment as evidence. Ironically ParkingEye themselves have also argued in court that PE v Beavis and Wardley is not applicable to paid car parks. This does seem an unusual approach as they base their whole justification on this case. ParkingEye also regularly fail to mention in their claim that this case is going to the court of appeal in February 2015. Defendants should therefore also take with them HHJ Moloney's right to appeal document, available on the exhibits page. The Prankster also notes that DDJ Mahy has followed HHJ Moloney's decision that ParkingEye are the principal in the case. The Prankster disagrees with her, but she can only rule on the evidence before her. ParkingEye improperly redact contracts when they show them to judges to give the impression they are the principal. ParkingEye have previously threatened to take legal action against the Prankster for exposing the fact they improperly redact contracts. However, The Prankster can confirm that the contracts supplied to both HHJ Moloney and DDJ Mahy were improperly redacted and therefore deceived both judges. Judgment has now been handed down in the Snowdon case referred to earlier. To summarise, the motorist fell and injured themselves, resulting in an overstay in the car park which the motorist did not realise at the time. On receiving a charge for £100 from ParkingEye the motorist tried to make good the situation by paying the £2 extra parking charge, plus an administrative amount, to Snowdon Mountain Railway. This was refused. The motorist appealed to ParkingEye, which was refused, and to POPLA who ruled they could not take mitigating circumstances into account. ParkingEye then started court proceedings, where a robust defence was prepared with help. The case was originally heard in August, but the judge decided he needed more than the 2 hours allotted for the case to decide the issues. It was rescheduled and was then heard in November by a different judge. The Daily Post reported on the hearing here. DDJ Mahy reserved judgment while she considered the issues and has now made her ruling available. DDJ Mahy ruled that the test case of ParkingEye v Beavis and Wardley did not apply. That case was for a free car park and ParkingEye needed to charge a large amount for transgressions to make it economic to manage an otherwise free car park. In this case, the car park was a pay and display car park generating substantial revenue. Therefore there was no need to charge a large amount for transgressions. This meant that charging £100 for an overstay worth £2 was not commercially justifiable and as the amount far exceeded the costs, the amount was therefore a penalty. The claim was dismissed and the defendant's full costs of £165 were awarded. ParkingEye will need to pay within 14 days or risk getting a CCJ which could mean their access to keeper data from the DVLA is barred. Although the motorist won in court they had to appeal to ParkingEye, appeal to POPLA, and go through two court hearings before their case was resolved. Motorists undertaking activities on Snowdon which may result in injury to themselves or their passengers should therefore take note and consider whether to take their business to a more tourist-friendly location. Snowdon Mountain Railway absolved themselves of the problem, even though the motorist tried to make good the £2 shortfall together with an amount to cover costs. The Prankster congratulates the motorist for his perseverance, and thanks all the people behind the scenes (you know who you are). The Prankster recently reported a court case where Civil Enforcement Limited made phone calls and sent texts to try and bluff the motorist into not turning up at the hearing. Now it seems CEL are at it again. This post on pepipoo details how CEL phoned up and tried to bluff the motorist into missing the hearing. However, late this afternoon, I received an e-mail from Lindsay Currie at Creative Car Park asking me to call her urgently to discuss the case. I rang to no avail, so I sent an e-mail saying that I was quite happy to see them in court but if they wanted to discuss it with me, to call me. Literally two minutes later, I received a phone call from someone purporting to be from a solicitors firm to discuss the matter. At first he wanted to discuss settling the case, but when I told him that I was not willing to settle for anything other than written confirmation that the hearing had been vacated, he started to say that he wasn't willing to put anything in writing and that he had spent too much time already on this case and just wanted to agree now, man to man, that this was the end of the matter so we didn't have to waste time at a hearing. When I pressed him on the written confirmation, he became irate and slammed the phone down telling me he would " see me in court". If CEL turn up at court but the motorist does not, they will win and may be able to get high costs. If the motorist turns up but CEL does not, the motorist will win and may be able to get high costs. If neith party turn up, the result depends on the judge. If both parties turn up, then the motorist has always won so far if the defence is good. The Prankster advises taping phone calls when you can. Although the recording may not be admissible as evidence, you can make a transcript, which may be admissible. In any case, consider creating a supplementary witness statement detailing the events. Make 3 copies and hand one to the judge and state you have a procedural matter to bring up right at the beginning. You can state this phone tactic appears to be a regular occurrence and refer to my blogs as evidence. Ask if a contempt of court has occurred. If you meet the 'man in a cheap suit' from CEL before the hearing, hand him a copy, state you will be bringing this to the attention of the judge and watch what colour he turns. He will no doubt try and protest to the judge that the witness statement is filed after the deadline, but your response is that this is an important matter and the judge can overrule such deadlines if he sees fit. This sign in an Armtrac car park explains it is for permit holders only and directs the reader to find the terms and conditions. What an interesting wheeze. "You agree to your vehicle being issued with a parking charge notice." It appears all vehicles are liable to a charge of £100, permit or not. No doubt the residents will be asking Armtrac to change the terms. The Prankster wonders how they will get in touch. As previously reported, PO Box 154 does not appear to exist, and TR20 9WD does not appear to be a valid postcode. The DVLA have informed The Prankster that they have stopped providing keeper data to Proserve from 1st December 2014. The Prankster is aware that the judicial review has not completed*, so The Prankster congratulates the DVLA for growing a pair after all these years of fence sitting. Perhaps the new DVLA appointment had a hand in the change of direction, which previously consisted of extended periods of doing nothing. Enheartened, The Prankster will now enquire when the DVLA will do something about the shambles that is the Independent Parking Committee appeal process, which can easily be demonstrated to be not independent. The Prankster previously blogged about Armtrac appeal rejections arriving late. The Prankster has been in touch with POPLA and the British Parking Association regarding post arriving from Armtac with only one or 2 days remaining to appeal to POPLA. In addition the BPA is meeting with POPLA tomorrow and will be discussing this issue. The BPA have also been in touch with Armtrac for an explanation. 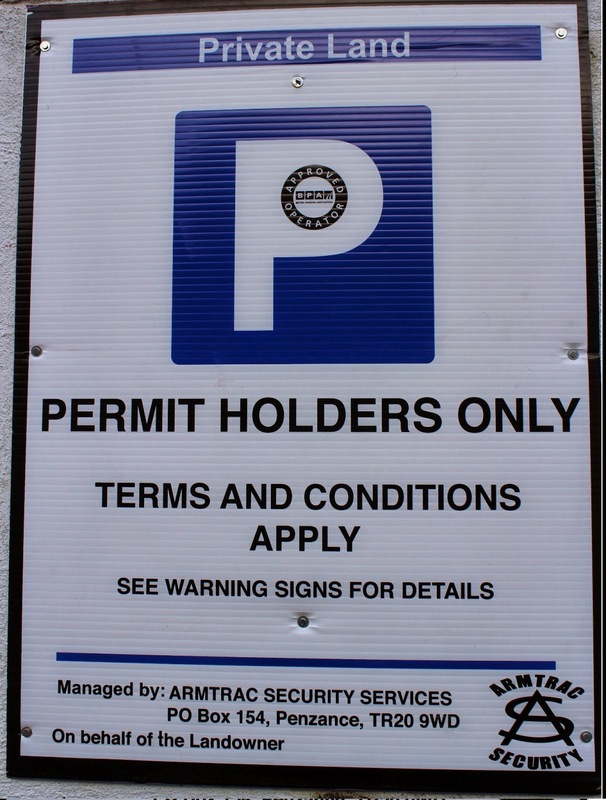 BPA - 06439 - ArmtracAs a starting point, I will grant a 7-day ‘grace period’ for those motorists potentially affected by Armtrac that you are aware of to get their appeals to POPLA if they wish – they should refer to this e-mail when they write to POPLA please. Alternatively the motorist can contact Armtrac directly to get a new POPLA code which will be valid for 28 days.This post on MSE describes where a motorist has already done this. Armtrac's explanation for the problem is this. Armtrac have confirmed they have been experiencing problems with the postal service in the area. Some letters are delivered within a couple of days and some are being delivered within a couple of weeks. If the operator is contacted regarding a late rejection letter being received, the charge is reduced back to £60 and a new verification code is sent out. Armtrac believe it to be an intermittent thing and believe in the interest of being fair, new codes will be issued if any motorist receives their letter out of time. The Prankster is currently in touch with the fraud department of the Royal Mail to see if this explanation is plausible. For instance, if a letter is dated 1st November, would it really hang around in the Royal Mail until 25 November before being postmarked. Perhaps there is a serious problem with the Royal Mail in Cornwall. Or perhaps the explanation lies elsewhere. The Prankster therefore asks motorists who have had problems to get in touch with him at prankster@parking-prankster.com and to send copies of the Armtrac letter together with the envelope it came in. The Royal Mail can then investigate the postmark, find the post office handling these letters and see if there is any dodgy goings on with their employees. MBC Parking admits breach of Company regulations. Why did the DVLA or BPA not pick this up? MBC Parking Solutions Ltd has admitted being in breach of company regulations. The PO Box address does not appear to exist, and there is no signage at this address. This does not therefore meet 'brass plate' requirements and is not a correct address for service. The Royal Mail state this PO box has not been paid for and TR20 9WD is apparently not a valid postcode. The Prankster has been led to suspect the correct address is Pengersick Lane, Praa Sands, Chenhal, Penzance, with the postcode either TR20 9SN or TR20 9SH. Companies house has been informed and MBC have acknowledged the addresses are either out of date of fictional and will be updating the registry. One of the reasons that addresses must be correct is for consumer protection. It is not known yet whether companies house is taking further action. The Prankster wonders why the DVLA and BPA audits have not picked this up. If this kind of thing is not checked during the audit, then perhaps it should be. What else do these audits miss, and are they just a rubber-stamping exercise rather than any true attempt to make sure parking companies are compliant with the regulations. Two posters on MSE have received appeal rejections from Armtrac Security Services with POPLA codes which have almost expired. To work this scan, Armtrac generate the POPLA code and accompanying letter, but then do not post the letter for several weeks, finally posting it second class. In a similar pepipoo post, the letter was dated 18th October, but only received on 4th November. 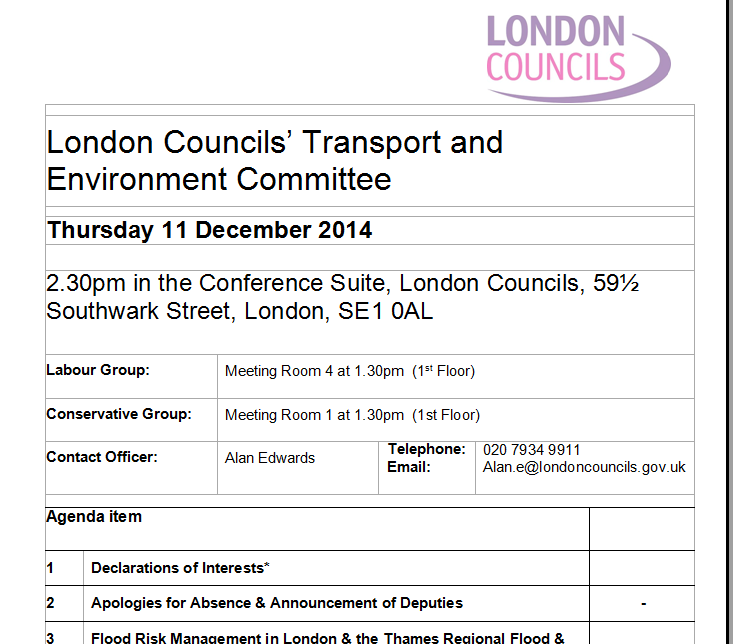 In another MSE post, the letter was dated 1st November and received on 28th November. There was no postmark visible on the envelope. This is clearly either an ongoing scam, or a failure to run a parking business properly. 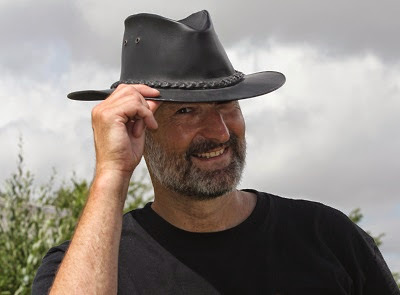 The Prankster previously blogged that Mick Cooke of Armtrac threatened to break the fingers of a person he disagreed with. The web site http://www.parkingticketappeals.org.uk/ has apparently changed hands. Yesterday, the company on the about page was Parking Ticket Appeals Limited, company number 08981061, incorporated 7/4/2014. The secretary is Ricky Gater and sole director Kiera Prince. Today, the company on the about page is Parking Ticket Appeals Service Limited, company number 08994668, incorporated 14/4/2014. This company appears to have one shareholder, Ricky Gater, and one director Ricky Gater. The Prankster contacted the new company to enquire about current customers of the old company, and the new company liability to pay the parking charge under the guarantee if their appeals fail. Ricky Gater told the Sunday Times that that company was processing 400 appeals a week, and as appeals can take 2-3 months, there may be up to 5000 active customers. "It should not be lost on yourself that liability as previously explains lies with the company and liability cannot be transferred to another company"
The Prankster does not consider this an appropriate duty of care to previous customers, and has therefore removed all links and recommendations from his website to the company. 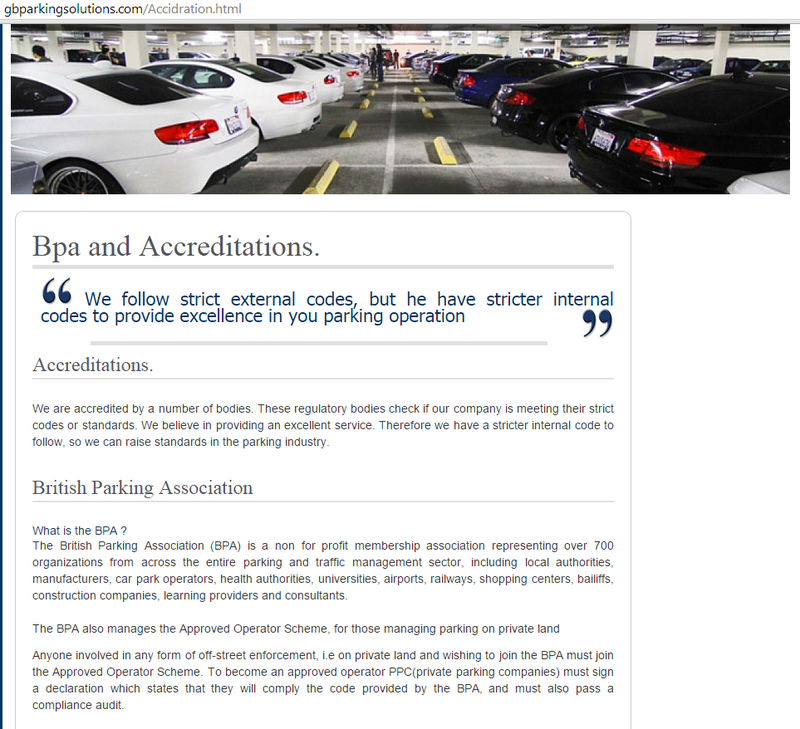 GB Parking Solutions were chucked out of the British Parking Association on 18th November. This was because they exceeded 12 sanction points in a 12 month period. Additionally, according to a poster on pepipoo, they are "in the process of being struck off by Companies House due to overdue accounts. The first "Gazette" entry was made on 11th November; (normally it takes 3 months from this date to complete the process)." Apparently, according to another poster, this has been the fate of all the companies run by this director, Mr Shamshar Singh. Shamshar Singh holds 2 appointments at 2 active companies, has resigned from 0 companies and held 3 appointments at 3 dissolved companies. Shamshar began their first appointment at the age of 21. Their longest current appointment spans 2 years and 0 months at GB PARKING SOLUTIONS LTD. According to the DVLA they have been banned from keeper access from 11 August 2014. Their web site does not appear to be in 'English'. It appears they will no longer be providing 'excellence in you parking operation'. The Daily Mail recently ran an article regarding the DVLA providing data to dodgy companies. The Prankster wonders what kind of checks are actually put in place to prevent companies like this getting data in the first place? The Prankster recommends anyone who gets a windscreen ticket from GB Parking Solutions waits for a Notice to Keeper to arrive. For the keeper to be liable, this must arrive between days 28 and 56. However, as they have no access to the DVLA database, this is unlikely to arrive. If the windscreen ticket refers to POPLA then the Prankster recommends referring this to the BPA and to trading standards. Only BPA members can use POPLA, so this is a false claim.